The Pope is using Islamic Terrorism to push Ecumenism?! The man of sin will stop at nothing to garner more souls into the Babylonian church. The craftiness of his speeches wherein he expertly twists the truth regarding the plight of Christians who die for their faith is appalling to say the least. He is using their deaths as an global call for ecumenicalism. But this shows his card a lot more graphically that even he can surmise. What I'm getting at here is the fact that those of us that have done our homework know, #1, the Vatican has been all about creating the prophesied One World Church since the ecumenical dogma was introduced at Vatican II. And #2, those of us that have eyes to see who have not been blinded by the false claims that Islam is THE Antichrist or even that Turkey is somehow to be seen as the King of the North, we know the Popes of Rome wrote the Koran 20 years before Mohammed was born so as to have an army of loyal pawns that will do her bidding towards global dominance near the end of time. With these two obvious factors in mind, the Jesuit Pope has given us a glimpse of the ace up his cassock sleeve. The fact history records the genocidal martyrdom of hundreds of millions of Christians during the Vatican's prophesied Inquisitions, and the fact the Muslims are not only loyal to the Pope of Rome via their own salute, they are doing as commanded by killing just as many Christians each year for the Pope just as the Civil authorities did during the Inquisitions. 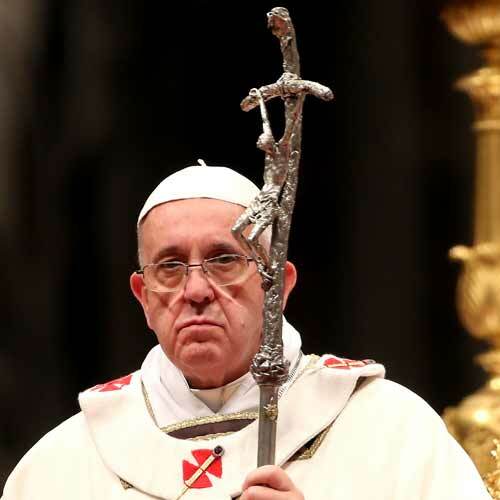 We now have concrete evidence the Pope of Rome, a sworn by blood oath Jesuit, has declared the martyrdoms of millions of Christians today is in fact the means by which his office has chosen to validate his agenda towards the long prophesied ecumenical church of Rome that his dying god needs as his Armageddon troops. This evil act not only helps the Pope push his agenda forward towards building that very army he will hope to use to surround the few that escaped his blade on that great and dreadful day. It allows him to lower our ranks by millions using the Muslims to kill our brothers and sisters all around the world. But then, prophecy never said there would be millions standing in the number we affectionately call the Gideon Band. As prophesied, we will only see 144,000 standing in that number during the Plagues. That all being said… are you prepared? ARE YOU SURE? poGm VIDEO: Armageddon Bunker sales UP 700%! And why is that you ask? It's because Barack Hussein Obama is in fact a Muslim. I have quite the mountain of evidence compiled to confirm that as a bonafide fact listed here. Now don't get me wrong. He is the American president and being as such he needs our prayers. For it is plainly stated in Romans 13:1-7 he is ordained of God to be in that oval office whether you like it or not. And as we see from the Old to the New Testament, the obedient people of God did always pray for their kings. This also included the conquering kings that took them captive. What many fail to realize is that what we see happening in America is the people's fault much more than it is the fault of our political leaders. What I mean is, look back in time. Whenever the people of God embraced the Pagan gods of old the Lord of Heaven allowed evil nations to attack and conquer them so as to help them see the need to repent. Kind of like a spiritual spanking if you will. In Jeremiah's day we saw this plainly with Nebuchaddnezzar. The apostate leaders of Israel refused to obey the Lord and the majority of the people followed their lead into apostasy and so they were punished (as warned by the obedient prophets) by the God of Heaven. Nebuchadnezzar was sent to punish the people and take them captive. This is actually how Daniel, an obedient child of God ended up in Babylon. When America started it was prosperous because of its desire to be obedient to the Lord. They saw what the Paganism of Catholicism brought upon them and they simply had enough of watching loved ones become Pagans and other loved ones being burned, buried and skinned alive. Every nation that came against us failed because we trusted God to protect us and He did so every well. But Satan always has his followers hidden deep in the mix. Looking back we see what's happening in America is the same that happened many nations before us. Take the prophet Daniel who after being in captivity for many years was exalted by the king. After all, is it not written in Proverbs 3:4, "So shalt thou find favour and good understanding in the sight of God and man." As expected, Satan entered into three leaders in Nebuchadnezzar's kingdom and moved them to become very jealous of Daniel who by now had been exalted by God to being over them due to his obedient to the Lord. It says in Daniel 6:5, "Then said these men, We shall not find any occasion against this Daniel, except we find it against him concerning the law of his God." Unlike the Christians in America, even though they tried to use Daniel's love for God against him by getting a law passed that would make worshipping the Lord illegal; Daniel continued to kneel in worship three times a day. As we know he was thrown into the lion's den and because of his obedience, the God of Heaven spared him an awful death. The lions did not touch him. After the king saw all this, the men that tricked him into passing the law that was designed to get Daniel killed; were all thrown into the den of lions with their wives and children to be consumed. My point is, when those same demons that moved those wicked men in Daniel's day suggested the same thing against the Americans in our infancy, many of our forefathers fell for it! Everything from the sinfulness of Hollywood, the Pagan celebrations of Christmas and Easter to the violence of sports and demonic suggestions upon our children thanks to Disney was embraced by Americans to the point that eventually, we were no different than the Pagans that were sent by God from Rome who infiltrated our nation's highest halls of Congress to punish us. And this is what Obama and everyone else in bed with Rome are doing. This is the only reason we see a Muslim man working hand in hand with the Jesuit Pope in Washington. It's our just deserts! But, not every American Christian is disobedient. Many, like Jeremiah, Ezekiel, Daniel, Shardrach, Meshach and Abednego still obey the Lord thy God of Heaven even while living in a de facto government. We still pray for Obama and the others in leadership positions. I mean, who knows? Perhaps one day one of our leaders may see the light of truth as did Nebuchadnezzar and actually become believers as he did. Still.. the prophecies concerning the USA will be fulfilled. Men and women like Obama who have the power to help God's people will continue to make it a point to openly refuse to do so and will remain in power up until that eastern sky splits. Reason being is, and this is only for a little while longer, many Christians still haven't been shaken enough to snap out of it. Ezekiel 39:28, "Then shall they know that I am the LORD their God, which caused them to be led into captivity among the heathen: but I have gathered them unto their own land, and have left none of them any more there." Ezekiel 37:12-13, "Therefore prophesy and say unto them, Thus saith the Lord GOD; Behold, O my people, I will open your graves, and cause you to come up out of your graves, and bring you into the land of Israel. And ye shall know that I am the LORD, when I have opened your graves, O my people, and brought you up out of your graves,"